The other day while we drove down the road and I listened to my son ask for a movie for his two minute trip, I couldn't help but think that I am doing my children a huge disservice by not forcing them to look out of the windows at what is passing them by. I am very guilty of being in such a hurry with a goal in mind that I often don't take the time just to look around me! I think it is time to go back to taking "Sunday drives"! My grandparents used to take my two sisters and I on drives on the weekends when we were young. The three of us would sit in the back and put on our "life jackets" (that's what Grandma called them) and beg for stories from Grandma and Grandpa! Grandma would tell us how she grew up as the only girl in a house of boys. One of our favorite stories was when she threw eggs at her brothers from out of her bedroom window! 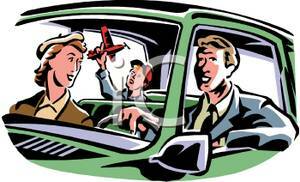 We would laugh and laugh and laugh while we drove looking out of the windows at the scenery that flashed by. Sometimes we would stop by golf courses and Grandma would have us get out and search for golf balls. 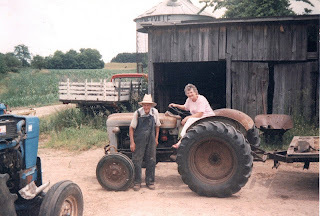 There were days we stopped at a park and walked the trails finding treasures in the woods and other days we would stop at my great uncle's farm. On the farm, he had dairy cows, tons of cats, dogs, and an outhouse! It never failed that as soon as we pulled up into his drive my sister would have to use the bathroom and my Grandma would plug her nose and dive into that outhouse with her! We were fascinated with the little house that smelled of gas and had no bathroom! We would run through the corn fields and explore the barns trying to steer clear of manure! We didn't require flashing lights, bells and whistles, or non-stop action to keep us happy and entertained all of the time! In fact, if I look back, I can't begin to tell you what movies I saw as a child or the computer games I played, but I can tell you about the conversations we had in that car, the walks we took, and the natural simple treasures we found! It was on these drives that we got to know our grandparents and the world around us. We would have never heard how my Grandpa followed my Grandma home from church to begin to court her or how my Grandma thought the world was coming to an end when she went to see her first movie in a theatre that they not made us slow down a little. (Her dad never let them see movies and pretty much said they were evil. She went to see her first movie in a theatre when she moved to California. A earthquake occurred while she was watching the movie and she just knew her dad was right!) These are memories that will follow us our entire lifetime. My exciting game of Jumpman on the Commodore 64 just doesn't rank up there with my mental image of my Grandma's brother with egg on his head! Try to remember to slow down a little. Turn off the radio and the television. Take the time to pull over at a park you have never explored and go for a short walk! Tell stories and have conversations! 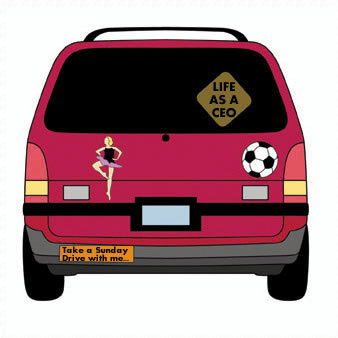 Take a "Sunday drive"!